Postman Pat's van is a brand new, full sized, UK designed and built pedal van that will last longer and grow with your child. 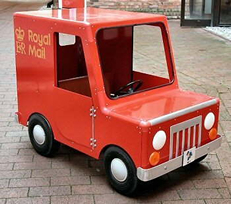 A true representation of Postman Pat's van, it is made from a steel chassis and rust free aluminium body, finished with a fade resistant powder coat painted for a durable finish and long life. To our knowledge, Postman Pat's van is the only production pedal van in the market place and is built to a standard that exceeds the norm! This car has been strictly designed in close conjunction with the original car. UK design and manufacture, Aluminium (rust free) body, Box steel (strong) chassis, Pneumatc rubber tyres, Adjustable Seat to allow growth, Safety designed ABS plastics, Dash mounted dials, Rotary chain pedal drive. inc vat & UK mainland Delivery. LIMITED STOCKS .6-8 weeks delivery.